After a major electromagnetic storm cripples communications worldwide, a new satellite-based Airborne collision avoidance system (ACAT) air traffic control system is struck, with debris hitting the earth. The malfunctioning satellite puts all air traffic in danger on the U.S. east coast where it is being operated on a "pilot project". 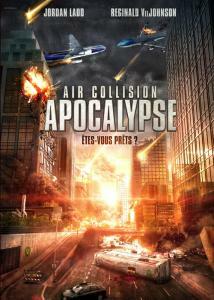 Consequently, two aircraft are heading on a collision course. One is a commercial airliner carrying hundreds of passengers while the other is Air Force One, carrying President Phillips (Andy Clemence), the President of the United States, and his family. The ACAT begins sending out errant commands that put both aircraft into serious jeopardy. In the severe electric storm, satellites begin failing with debris hitting major populated areas in the United States. Dr. Antonia "Toni" Pierce (Erin Coker) comes upon some of the debris and contacts Cleveland FAA Air Traffic controller Bob Abbot (Reginald VelJohnson). Abbot tries to prevent the looming disaster, overriding all top level directives to keep aircraft flying, he wants to ground all traffic. Both the commercial airliner and Air Force One are struck by repeated lightning strikes that partially disable the aircraft. The damaged satellite signals cause the ACAT to wreak havoc on the escorting F-16 fighters. The McDonnell Douglas MD-80 airliner also loses both engines but gets a restart just before impacting. A rogue Sidewinder missile from Air Force One also strikes the converging airliner and both aircraft impact in a glancing hit. The airliner crash-lands in Cleveland. An Air Force Lockheed C-130 Hercules rescue effort ultimately fails to bring Air Force One's passengers to safety, and electrical impulses affecting the president's aircraft kill the flight crew, leaving the only alternative being the President's daughter (Stephanie Hullar) attempting to disable the ACAT system. When the ACAT is finally overridden, the President takes control of Air Force One and brings it into a landing at Detroit.